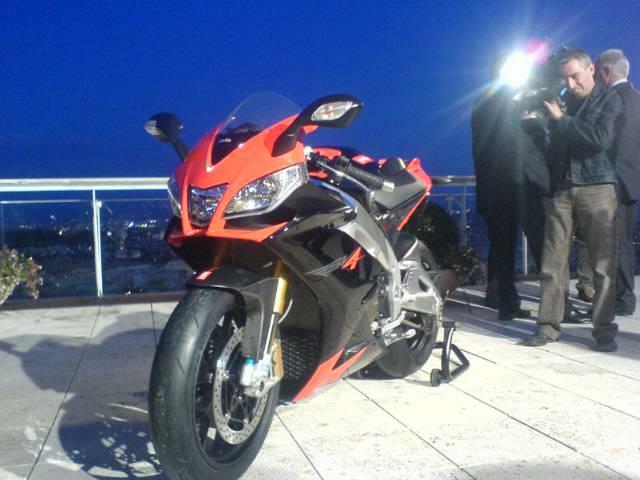 MCN News Reporter Chris Newbigging is in Rome right now at the launch of Aprilia's new RSV4 and he's just sent through this camera phone shot and some info on the bike as a little teaser. The new 1000cc V4 is set to feature ride-by-wire throttle, hi-tech electronics which Aprilia claim make traction control possible and an engine designed and built in-house by the Italian firm. As you can just about make out in the picture, the bike features Ohlins suspension and radial brembo brakes. What you don't quite get from the picture is a sense of just how small and compact this new Aprilia supersports machine is. Aprilia have revealed that the new RSV4 weighs in at 190kg fully fueled, which incidentally is 9kg less than a Honda CBR1000RR Fireblade weighs with an empty tank. The RSV4 will be available in 2 versions- the higher spec Factory version will feature better suspension and brakes, but both have adjustable engine mounts allowing the engine to be moved 10mm up or down, as well as a movable swingarm pivot and a changeable head stock angle. Aprilia have yet to release a power figure for the road bike, but the race bike is making 210bhp at the gearbox. Aprilia have ambitious plans for their 2 rider WSB race team- they plan to finish in the top 10 in year 1, be winning races in year 2 and win the championship by year 3. They've already signed Max Biaggi for one slot but the other rider has yet to be announced. Miguel Galluzzi, RSV4 stylist famous for creating the Ducati Monster and Cagiva Raptor, claims that a naked Tuono style streetfighter version of the RSV4 is on the cards in the future. We'll have more news and official pictures from the launch on motorcyclenews.com later this weekend, so check back to be among the first to see more of Aprilia's latest offering.